Blackjack odds should be known by every gambler to evaluate his/her probabilities for winning; the interesting thing is that these blackjack odds always depend on a player's decisions during the game, that is why the main thing is to know which option will be better and more profitable for you during the game and choose them in order to make your winning closer. As we know, blackjack card game is usually played with 8 decks of cards; but some casinos can allow playing this game with fewer decks. So, if you want to get better odds for winning - choose the blackjack table where the game is played with fewer decks of cards. The perfect variant for you is 1 deck blackjack because the house edge here is the lowest - just 0,17%. 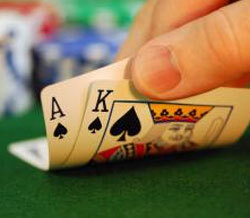 Some casinos determine the following rule for a dealer: s/he should stand on 17 and hit all hands of 16 and lower. So, if the rule to stand on soft 17 exists in a casino - you are welcome to choose it for playing blackjack because your odds to win are better here: your edge is 0,2% in this case. Always choose a casino which allows players to double on any cards and split after doubling (sometimes, casinos also allow to double after hitting) - your edge here is 0,12% (it is also great when a casino allows you to split soft hands). Moreover, if you are allowed to re-split - add 0,03% more to your edge. It is more preferable for a player to choose a casino which allows early surrender: together with blackjack strategy knowledge it allows you decreasing your losses to minimum.